Has many of you know Lisbon has been lately attracting a lot of IT Companies and the Startup sector had an amazing boom in the past years. 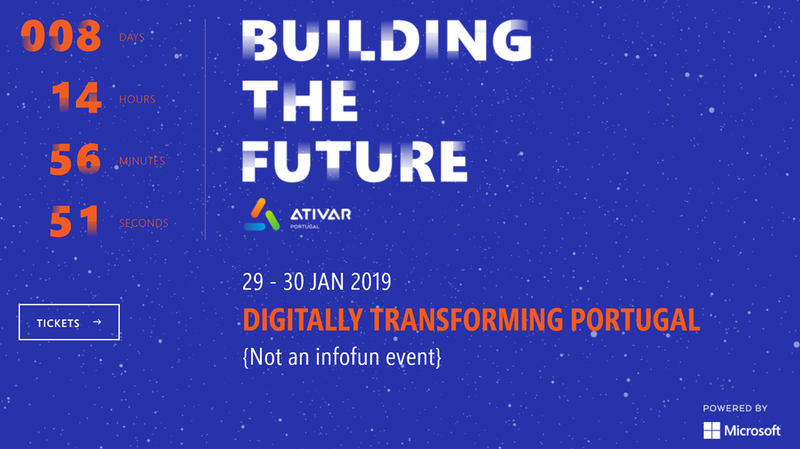 We also have great events like Web Summit, but we needed an event with content targeted at IT Professionals, so on the 29 and 30 January 2019 it will take place “Building the Future”. Building the Strategy: A track for IT professionals that need to help the company with your IT Strategy. How technology will impact your market? Are you ready? Not Sure? You should attend this track!!! Building the Foundations: Real world experience on how existing technology can help you company today. Building the Code: 2 tracks in parallel! There are so great topics like DevOps, Infrastructure as code, Serveless, Containers, ML, Big Data, AI, IOT, Bots, Cognitive Services, … All this will be on those 2 tracks! Building the Lab: Hands-on labs with great names of the industry. It’s your chance to try hands-on a product during the lab with support of a great professional. Hackathon: Toghether with Farfetch there will be a great hackathon to build the revolution of the fashion industry. Do you have ideas on how the industry should be in the upcoming years? SignUp Now for this!!! Intelligent Day: You’ll be able to experience the future and let’s try to predict how technology can change your life’s. Startup World: Were the entire Portuguese entrepreneurial ecosystem can meet for meaningful interactions. Together with great names from the industry (https://www.buildingthefuture.pt/speakers), I will talk about how companies should think Infrastructure in Microsoft Azure and how ARM templates and Azure DevOps can help then in this tasks. Attend my sessions, amazing content will be presented in a demo-dependent session and with amazing gifts! Let’s build the future toghether? Hope to see you during the conference! Previous Article2018 is dead, long live 2019!! !